Global DNA methylation levels in the genome can be altered during specific pathological, environmental, or developmental states. DNA hypomethylation, or a decrease, has been proposed as a molecular marker in multiple biological processes, including cancer. Accurate measurement of total 5-methylcytosine (5-mC), as well as 5-hydroxymethylcytosine (5-hmC), amounts can help epigenetic researchers to better understand the effects of drug and environmental exposure, thereby leading to more detailed investigations of DNA hypomethylation prevention or reversal. Assessing global DNA methylation has proved useful to many researchers investigating the role DNA methylation plays in developing diseases, especially cancer. Aberrant methylation of DNA is often found in cells of tumors. Specifically, global hypomethylation has been shown to cause chromosome instability and global hypermethylation has been linked with inactivating genes that protect the body against tumors, called tumor suppressor genes or antioncogenes. Measuring global DNA methylation can be useful for pre-screening large sample sets or as a way to compare different groups such as diseased versus normal or drug treated versus control. 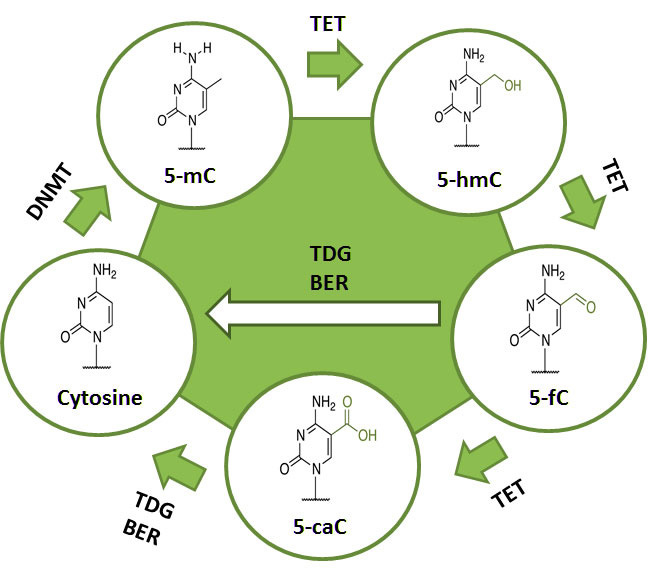 One can also screen for the intermediates of the process of DNA methylation and DNA demethylation – such as 5-methylcytosine (5-mC), 5-hydroxymethylcytosine (5-hmC), and 5-formylcytosine (5-fC) – due to the dynamic nature of DNA methylaion (Fig. 1). Various methods for assessing DNA methylation on a global scale include LINE1 and LUMA assays through pyrosequencing or end-specific PCR, M.SssI acceptance assays, and liquid chromatography or mass spectrometry techniques. However, as global DNA methylation is often used as a screening tool prior to a gene-specific or in-depth assay, these methods do not present a practical means for efficiently obtaining desired results due to inaccuracy of data or extremely high costs, as well as niche expertise needed. This is why an alternative, more pragmatic method is needed. In fact, a particular technique seeing rising popularity delivers comparable results to the gold standard of LC-MS/MS. In this white paper, we discuss the above elements and this particular method in further detail, and show you what a practical method for global DNA methylation truly looks like. To learn how you might be able to apply this assay technique in your epigenetic research, download our white paper to the right of this page. DNA methylation assays for epigenetic studies.